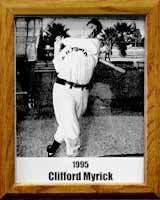 While attending Tucson High School, Clifford Myrick played on the state championship baseball team in 1945 and led the team in hitting with a .533 batting average. It was during his high school years that he played on the Tucson American Legion team coached by the great Chuck Hollinger. One of Cliff’s high points came when he played in the Junior Legion World Series in Shelby, N.C., in 1946 where he was runner-up for the national batting average championship. The University of Arizona offered Cliff the opportunity to continue playing baseball under Frank Sancet. In 1952 he graduated from the UA and entered upon his career as a TUSD teacher and coach. He coached baseball, girls’ softball and volleyball at Catalina High School for 27 years. Although he retired from teaching in 1989, Cliff finds time to volunteer at the YMCA and his church. He works for the Forest Service in Colorado during the summer months. Throughout his teaching and coaching life, Cliff officiated football and basketball and is a member of the Tucson Officials and Arizona Interscholastic Associations. Cliff was greatly influenced by Coach Hollinger and the experience of participating in the Junior American Legion program. He was motivated to continue with his education and, through his chosen profession, was able to have a positive influence on many young lives. Cliff was inducted into the Arizona High School Coaches Association Hall of Fame in 1988.